Persistent afternoon fog and frost at Mooncoin on December 1st. The month began very cold with temperatures almost reaching -6°It then got milder and wetter as we approached Christmas. It was a pretty normal month in terms of rainfall and temperature. There were ten days with air frost with the coldest temperature of -5.9° being recorded on the 1st of the month. But there were several mild days also including Christmas Day when it reached 13.5°.The warmest day was the 7th with 14.4°. The rainfall total was 80.5mm, with the wettest day being the 13th with 15.2mm. Highest wind gust was 66 km/hr as Storm Barbara passed to the north. 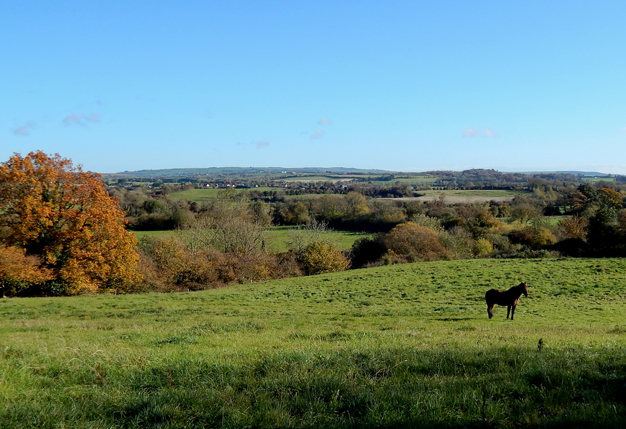 Looking east over the Nore valley, near The Rock on November 5th. The month began dry and crisp, with the drought from October continuing. It was a cold but dry month dominated by anticyclonic conditions. As a result frost and fog were quite common. The mean temperature was only 5.3° almost 2° below normal, almost as cold as November 2010. There were 15 days with air frost with the coldest recorded on the 30th (-4.9°). The highest temperature of 16.4° was recorded on the 14th. The rainfall total of 40.7mm was less than half the normal with much of this falling on three days (8th,11th and 17th). Top wind gust of 59.4 km/hr occurred on the 17th. 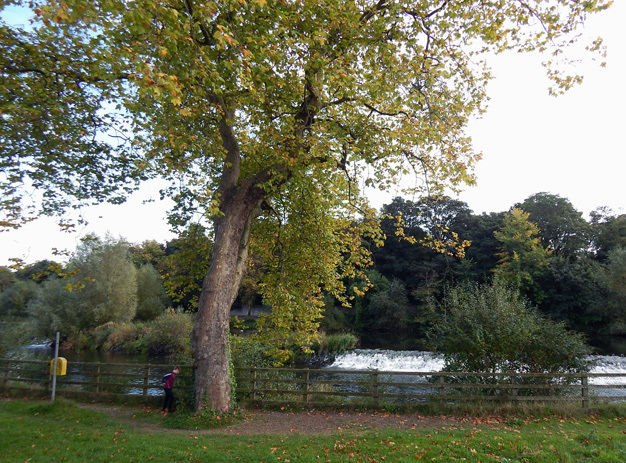 Benign October weather on Sunday 9th near Ormonde Weir, Kilkenny. Bar a brief wet period at the middle of the month , the month was dominated by a Scandanavian High Pressure. It was a very dry month with a total of barely over 1" (27.9mm). The driest October in Kilkenny since 1970. Only three days recorded 1.0 mm or more with the wettest being 17.6mm on the 14th. The mean temperature was 10.7° just a little above normal. The nights were cool with ground frost on 13 occasions, but no air frost. The lowest temp was 1.4° on the 14th with 16.8° being the highest (recorded on three different dates). 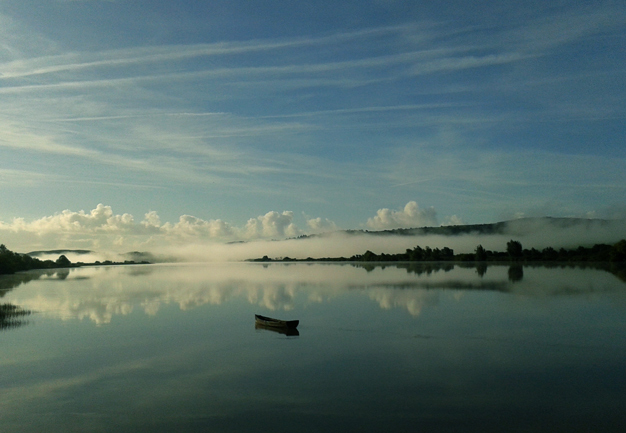 Fog clearing from the River Suir at Polerone Quay, Co. Kilkenny on September 22nd. Despite a wetter than normal month there were many such pleasant warm days this month. The mean temperature was just over 1° above normal. There were 8 days over 20° C with max of 25.7° on 5th. There were 3 days with ground frost and the lowest air min was 2.2° on the 22nd. It was our warmest September in 10 years. It was a little wetter than normal (our wettest in 6 years). The wettest day was the 9th with 12.3mm of rain. Top gust of 62 km/hr was recorded on 24th. 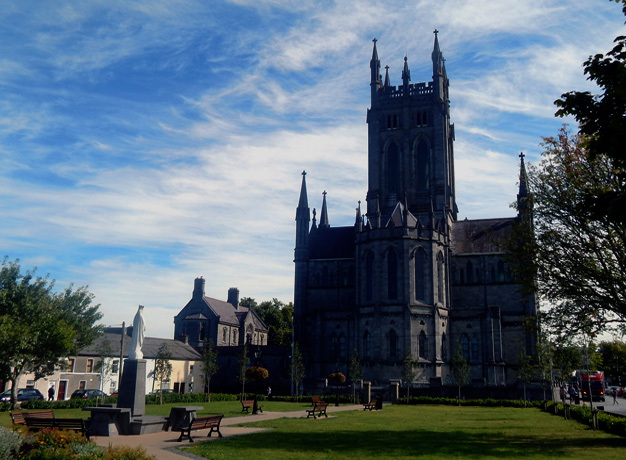 St Mary's Cathedral and James' Green in a background of blue sky and cirrus cloud on the 25th. There was a lot of mixed weather in August. Overall though it was a dry month. The mean temperature was about 0.5° above normal. Day time maxes were normal but the nights were about 1° above normal. The warmest day was the 16th when it reached 24.2° . It was a dry month with only 47% of normal rainfall. There were only 7 days with more than 1.0mm of rain. Top gust of 63 km/hr was recorded on 20th. It was our driest summer (June, July, August) in 10 years. It was also somewhat warmer than normal. Our warmest in 3 years. The temperature was already over 22° at 9 UTC when this picture was taken on the Parade, on Monday 18th. During the third week an anticyclone over the near continent steered up some warm southerly winds. The following day the temperature reached a very warm 28.3°. this was Kilkenny's hottest temperature in 2 years. After a cool first two weeks, July warmed up considerably with some lovely days around the middle of the month. Overall mean temperature was 0.5° above normal laregly due to warmer than normal nights. Coldest night was the 3rd with a min of 5.6° and almost a touch of ground frost (with a grass min of +0.1°). Rainfall total of 31.3mm was less than half the normal (marginally wetter than 2014). It has been the driest month of the year so far. The peaceful Breagagh valley in Kilkenny City on June 1st. The last few days in May and start of June saw some stunning days like this with crystal clear blue skies and temperatures in the low 20°s. June had a sharp dividing line. 11 of the first 12 days saw temperatures over 20° but after the 12th, no day exceeded the 20 mark. Nights were still quite muggy and mild so that overall it was a warm June with mean temperatures over 1 degree above normal. Our warmest June in 6 years. The warmest day was on the 8th when it reached 24.2°. Coldest night was the 3rd with a min of 4.7° and a touch of ground frost . Rainfall was a little below normal (despite som thundery activity on the 15th and 24th). But it still was our wettest June in 4 years. Distant shower clouds over Ardnore, Kilkenny on a blustery May 2nd. 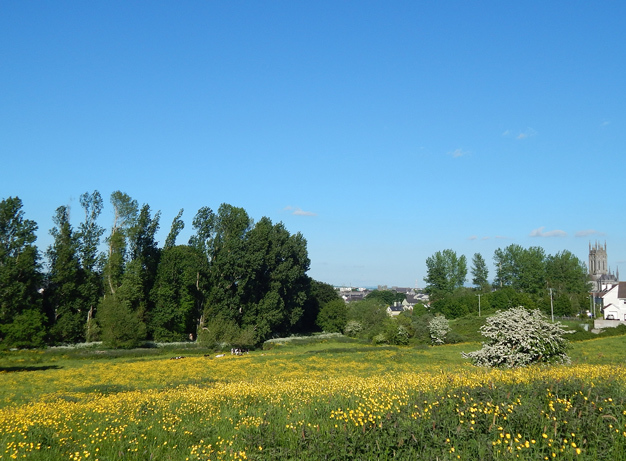 The month began promisingly with temperatures reaching 18.3° on May 1st - a big improvement on the previous month. Mean temperatures were over 1 degree above normal. There were many pleasant sunny days mixed with cool nights. On 8 days the temperature exceeded 20° with the highest temperature of 23.0° being recorded on the 12th May. The lowest temperature of 2.8° was on the 24th. Rainfall ended up a little above normal but the end of the month was dry and sunny. In fact over half the rainfall fell on only two days - the 9th (16.8mm) and the 21st (17.8mm). A passing light hail shower illuminates the evening sky over the Castle on April 16th. The first two weeks were quite wet and cool with several night frosts. Mean temperatures were again below normal following a cold end to the month. Air frost was recorded on 5 days with the lowest temperature of -1.6° being recorded on the 10th. The warmest day of April was on the 21st when it reached 17.5°. After a wet first half, there was very little rain after the 15th and overall the total was slightly below normal. Top wind gust of 64 kph was on the 28th. 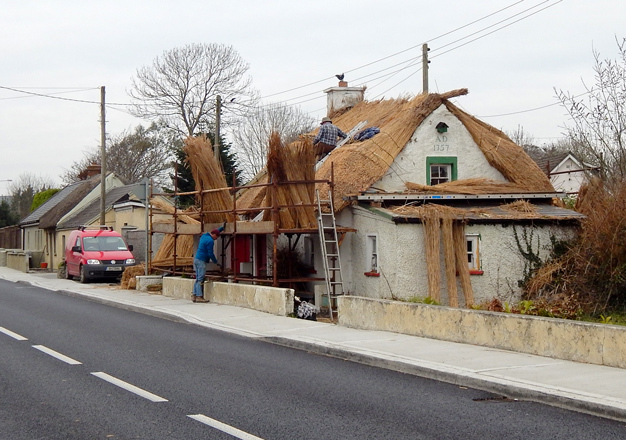 Master thatchers Matty Kelly and Jimmy Barron taking advantage of the fine weather at Mooncoin on the 16th March. There had been no measurable rainfall since March 8th. Mean temperatures were a half degree below normal. Air frost was recorded on 7 days with the lowest temperature of -2.8° being recorded on the 18th. The warmest day of March (and the year so far) was on the 11th when it reached 13.9°. That said there were some very pleasant days especially towards the end of the month with large amounts of sunshine. Rainfall was well below normal. Our driest March in 4 years. Between 9th and 22nd there was no measurable rainfall. The wettest day was the 1st when 9.4mm fell. Snow fell on the morning of the 4th and gave a light covering for a brief period in the City but with temperatures a little above zero, it melted very quickly. The highst wind gust of 77 km/hr was recorded on the 2nd (Storm Jake). The flooded King's River near Ennisnag, Co Kilkenny on the 17th. On the previous day there was almost an inch of rain in Kilkenny ensuring that February would be another above normal month for rainfall. Mean temperatures were exactly normal, after a cold end to the month. But there was little or no snow. Air frost was recorded on 11 days with lowest temperature being -3.6° on the 24th. The grass minimum that morning was -11.1°. The warmest day was on the 21st when it reached 12.7°. It was another wet month with a total of 103.7mm (169% of normal). The strongest gust of 85 kph was recorded on the 8th. An eerie fog forming over the fields near Clara, Co Kilkenny on the 4th January. The month began wet and misty but cooler and less windy than it had been in December. A mild end to the month ensured the mean temperature was slightly above normal. There were 10 days with air frost but none of them severe. The lowest temperature was -3.4° on the 16th. The mildest day was the 24th when it hit 13.7°.Rainfall was 114% of normal. Apart from a few fleeting showers, there was no lying snow. The strongest gust was 85 kph recorded on the 29th.